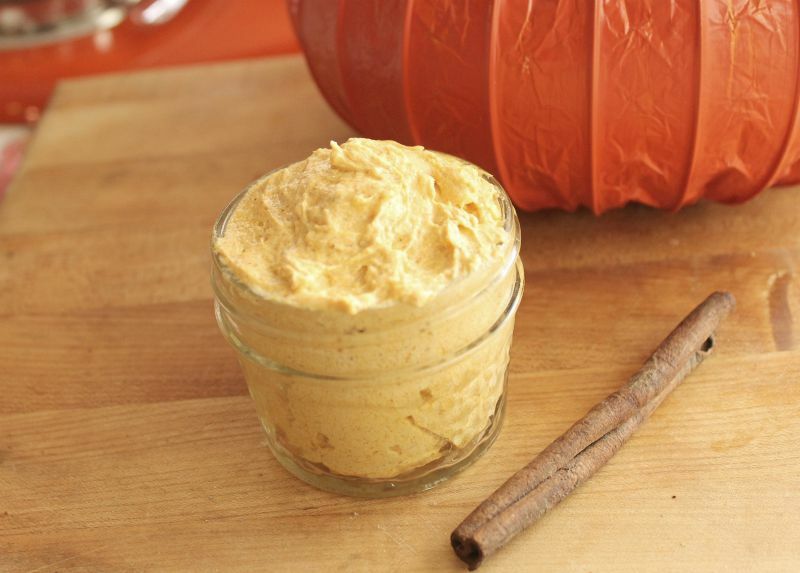 This Pumpkin Souffle Body Butter is a super decadent body treat you can easily make for yourself at home with simple ingredients! If you are not in the fall mood yet this concoction may push you right over the edge. Made with natural ingredients and scented deliciously with one of the most loved fall scents it is a decadent way to moisturize your skin and tempt your senses. While you get immediate skin hydration and softening benefits immediately, the effects are even better as it absorbs into your skin. Pumpkin contains antioxidants, vitamin A, and vitamin C- which softens, brightens skin, boosts collagen, helps reduce acne, and soothes your skin in general. Since this recipe is made with real pumpkin and does not contain artificial preservatives it will not last long, I divide mine into two small mason jars and share one. You could also freeze it in small batches or cut the recipe in half. 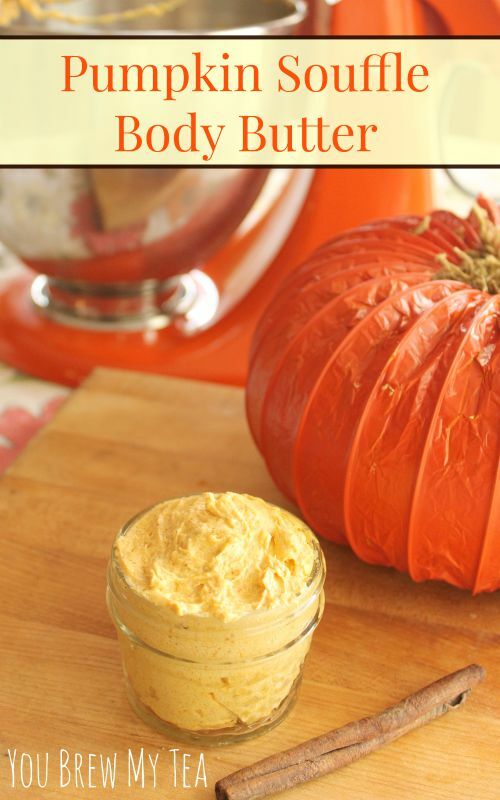 If you are looking for a luxurious fall scented body butter, this is ideal. Body butters differ from lotion because they are thicker, richer and typically contain no water. While water is hydrating to the inside of your body, it doesn’t really hydrate your skin. The combination of shea butter and coconut oil make this a super soothing homemade body butter you will love. 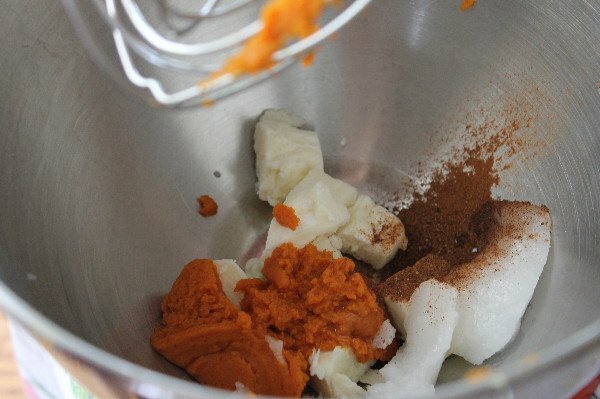 Place coconut oil, vitamin E oil, pumpkin, shea butter, cinnamon, pumpkin pie spice, and vanilla in the bowl of stand mixer. 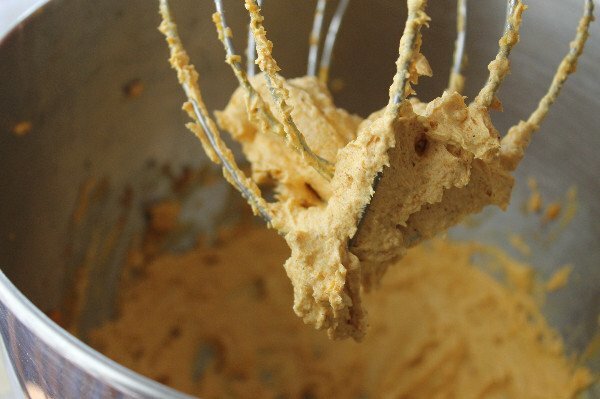 Blend on high until light and fluffy- about 3-5 minutes. 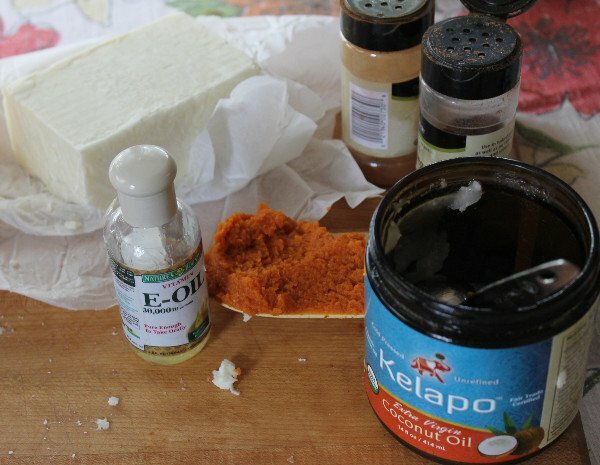 Scrape down sides of bowl, transfer all body butter in two 4 oz. mason jars in equal amounts. I keep mine refrigerated to keep it longer, should last about 2 weeks when in refrigerator. This makes an excellent gift, but since it is perishable should be given in small amounts with the warning label to use as soon as possible. Keep ingredients on hand, and you can easily make this for yourself year round! Use this twice a day all over your skin, but concentrate on rough or dry patches like knees, elbows and heels of your feet. It’s a super soothing luxurious treat that will totally change how your skin look and feels. Not to mention the wonderful smell! Add a simple ribbon and label, then add to a gift basket with some of our other favorite homemade body and beauty products! This sounds phenomenal It’s been ages since I’ve made body butter (using these same basic ingredients) and I’d love to have one that smells like this! It is amazing! Thanks for stopping by! Oh this would be heavenly! Can’t wait to try it. Thanks for stopping by and linking up at the Monday Funday Party! I am pretty sure the hardest part of this would be not eating it! I bet it smells divine. OMG I need this in my life like yesterday! I have to give this a try for real! I’d love for you to come link up with us over at Throwback Thursday ink party! We’ll be there!! Thanks for stopping by!